Here is an example of everyday life at the Ismail house. Hurricane Willie can destroy any room in as little as 30 seconds. I get so aggravated some days and I yearn to know what a neat and clean home is again. Nothing is ever in place anymore and it is just normal to step on plastic fish, bouncy balls or blocks. I find myself picking up after the little one and sometimes even the big ones all day long. I then say that I will no longer clean throughout the day and I will save it for once he goes to bed. It doesn't go down like that. 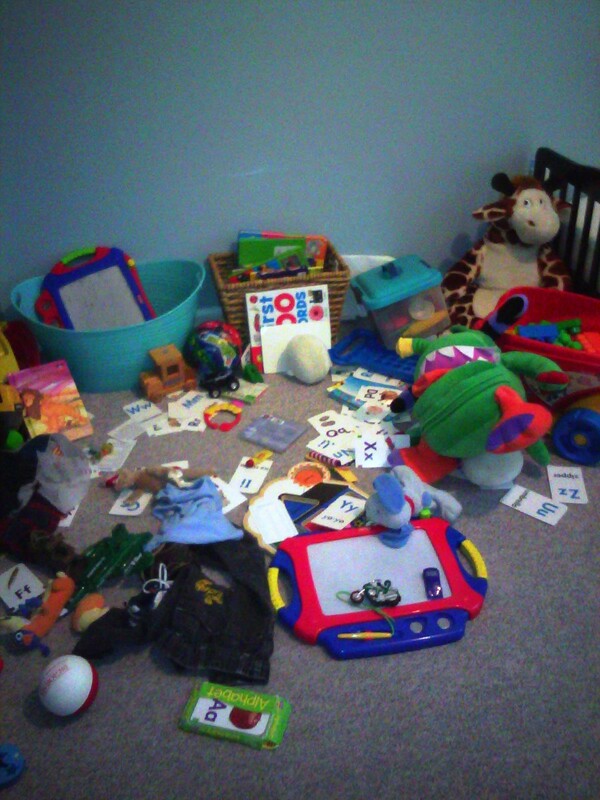 I wonder when this little boy will finally get it and clean up as I ask him to. Then I really get to thinking about how much I would not want things any different. I have healthy, happy children. That's all that matters. William will eventually learn to clean up after himself. There will come the day that I will wish I had someone to pick up after and photos like this will make me smile. If I didn't have Hurricane Willie to pick up after I think I would be bored! Honey, my boys still don't get it and clean up like they should. Same issue with my son. I eventually just purchased some bins so that way all he has to do is throw stuff in there. *eyeing William's stash* There's some good stuff in that pile! hahaha!!! Omg, it annoys me to no end straightening up the same toy clutter, day in and out. What is most frustrating for me is that I don't get any help. I mean, Chase helps when he is up... but, I mean, cleaning up at the end of the night (once Chase is in bed) is solely my job - and if I don't do it, things just remain there (if you know what i mean). But i digress. Totally can relate. While it's certainly tedious, i think we'll miss it once its gone!!!! Cuz that will also signify the end of a stage (baby/toddler), and that in itself is a little sad.